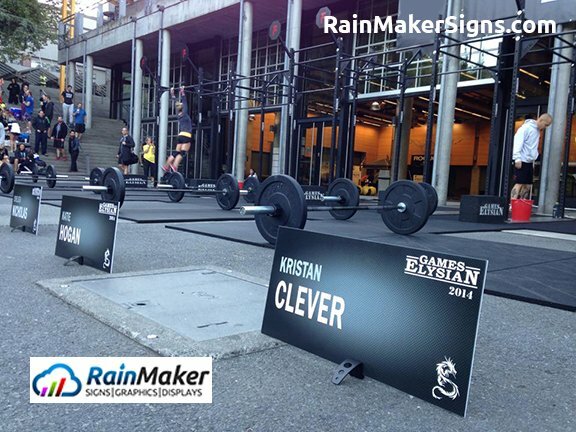 Exhilarating, energetic, motivational, athletic, relaxing, these are the types of workout environment RainMaker Signs' signs and graphics create for fitness centers and gymnasiums. Use signs and graphics to build the right atmosphere for your members and athletes! Signs and graphics assist gyms and fitness centers by facilitating their daily operations and supporting their members' workout. Gym signs and graphics custom made to align with your center's theme, needs, atmosphere, equipment, and athletic spirit. From start to finish of the project, RainMaker Signs offers professional signs and graphics advice and execution. Attraction Signs and graphics are a bold form of visual communication that convey your gym's brand character to attract members. Information Class schedule, opening hours, equipment rules and regulations, gym signs and graphics take on the role to notify members about these crucial information. Atmosphere A pleasant and energetic atmosphere is essential to motivate members to be persistent in their workout routine and goals. Belongingness Branded fitness center signs and graphics reinforce members' sense of belongingness to the athletic organization/team. Marketing Display and event signs are great tools that promote the gym's featured courses and membership offerings. Safety Warning signs and graphics, such as distraction banding and slippy floor signage prevents dedicated members from being injured. Prior to production, RainMaker Signs' sign experts will meet with you to learn about your facility, environment, and your brand for the best execution. If you need design help, our creative designers will illustrate effective signs and graphics that capture your brand's essence and mission. We understand the importance of branding consistency. RainMaker Signs can manage your signage project across all your business branches. Engage your members with custom and unique gym signs and graphics!